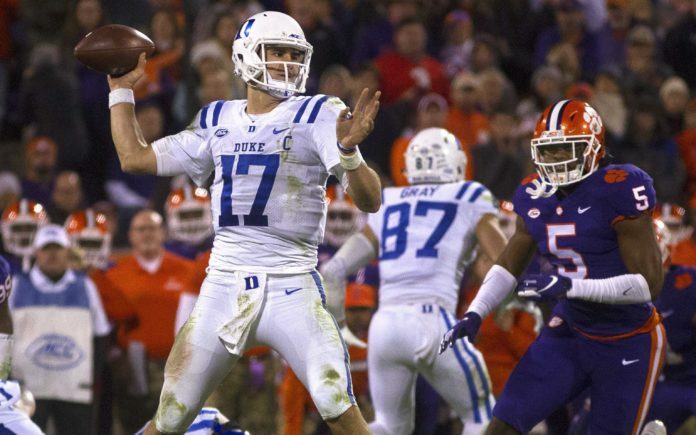 Broncos mocks: Could Denver take Duke QB Daniel Jones with No. 10 pick? Daniel Jones. Credit: Joshua S. Kelly, USA TODAY Sports. In CBS Sports’ latest mock draft, writer Chris Trapasso pegs Daniel Jones getting selected by the Broncos with the 10th pick in the draft. There’s no question that the Broncos are eyeing quarterbacks this offseaso. 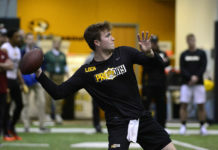 They’ve already taken a close look at Missouri’s Drew Lock, and they seem to become less and less invested in current quarterback Case Keenum by the day. Most recently, John Elway described Keenum as “Probably a short-term fix.” That should not be a surprise to Broncos fans, but it should raise their eyebrows that the general manager is publicly making these declarations. Now, with the Broncos likely to take a quarterback in the first round, it is fair to ask: Is Daniel Jones that pick? The Broncos already have ties to Jones in the form of Peyton Manning and David Cutcliffe. Cutcliffe is Jones’ head coach at Duke and is widely considered to be one of the best when it comes to coaching quarterbacks, in large part due to his work and close relationship with “The Sheriff” throughout his college and professional career. Like Manning, Jones’ strongest trait might just be his football IQ. 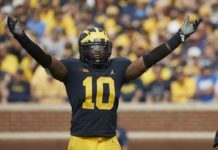 He’s smart with the ball and limits turnovers, but he is already showing the ability to do the little things typically only seen in seasoned, NFL veterans. Jones can read defenses and does a great job of manipulating the defenders with his eyes. Another trait that Jones possesses that you don’t often see from college quarterbacks is his excellent ability to layer passes and throw them with touch. Touch is an important part of throwing accurately, and Jones has it in spades. He is able to layer a ball right over the linebacker, behind the cornerback and right in front of the safety with a feathery touch. Jones’ touch shows up most on deep routes, which is probably the strongest part of his game. The Duke quarterback loves to launch the ball downfield, up high, and have his receivers run under it, something that would fit receiver Courtland Sutton‘s game nicely. Jones also has the ideal size most fans like — and John Elway loves — to see out of his quarterback. Jones’ 6’5″ 220-pound build is very similar to that of Carson Wentz or Josh Allen, though he is a touch thinner. He isn’t as athletic or mobile as Wentz or Allen, but he can take off when he needs to. The biggest difference between a quarterback like Wentz and Daniel Jones is the arm. Daniel Jones’ arm is strong, will he be able to make all the throws on the field, like Carson Wentz or Josh Allen can? Jones likes to put a lot of air under the ball and arc his throws, especially his deep ones, while quarterbacks like Wentz and Allen can throw frozen ropes to their receivers no matter where they are on the field. Jones’ lack of arm velocity will be difficult to develop and could lead to easy interceptions for the defense. The longer the ball hangs in the air, the more time the defense has to adjust, get in a good position, and attempt to pluck it out of the air. This is the conundrum surrounding Daniel Jones. Outside of Ohio State’s Dwayne Haskins, there isn’t a safer pick at quarterback in the first round. Daniel Jones’ ceiling is limited due to his arm ability but has an incredibly high floor thanks to his football IQ, size, accuracy, and touch. The odds of Jones becoming a Top Five or even Top 10 NFL quarterback aren’t great, but the odds of Jones flaming out and being off the team before his third season even begins, like Paxton Lynch, are even less likely. Could the Broncos use their No. 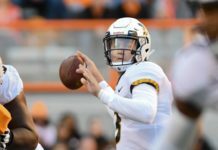 10 pick on Drew Lock?